FiveSecure™ is raising customers’ expectations of lone worker monitoring devices. Using cutting-edge technology and an advanced feature set it offers market leading cost effective solutions. Built and designed to Security Service specifications, our FiveSecure™ lone worker monitoring solutions have best-in-class functionality that combines the latest multi access GPS location technology with high security communication and data storage. 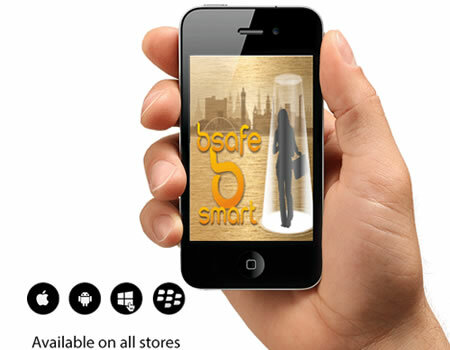 The BeSafe BeSmart App is offered for use on iPhone, Android, Blackberry and Windows platforms. To complement the reporting devices we spent over 24 months of research and development to create our combined tracking software, FiveConnect, receiving both GSM and satellite data transmission, to protect lone workers and the vulnerable in most situations. The App has two added services. “Watch Me” is an on request tracking service that can be used whenever a user feels put into an uncertain situation. The device will track the user for a specified time until either cancelled or an alarm is automatically reported. “Manage Me” is an interface to the smartphone diary. If the user does not arrive and depart a location within the time that was specified a text alert is sent asking for contact. No contact will result in the supervising agent initiating an alarm call. FiveConnect™ is a bespoke and unique, cloud based, secure, real time, access anywhere, web application. It features a robust end-to-end alarm management. The built in, multi-site functionality allows managers, both inside the Control Room, and at other secure locations to receive, view and respond to emergency alerts quickly and effectively. FiveSecure™ can monitor the safety of your lone workers using any Mobile smartphone application that can be paired with our own designed and built Bluetooth® IV communication devices that allow the user to trigger an alarm even when the host phone is not to hand. Providing the device is in range you can still benefit from FiveSecure protection.